The Growing Unitarian Universalism Facebook Page experienced quite the phenomena last week. 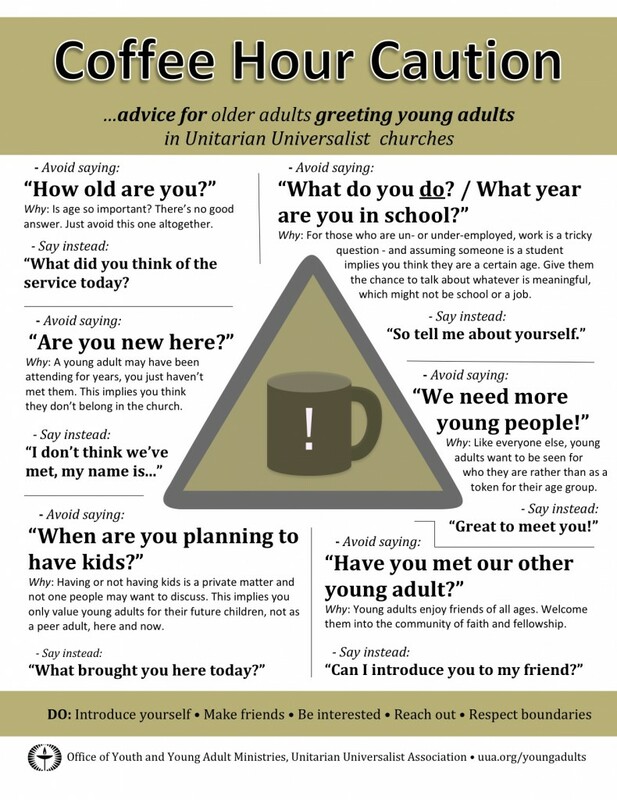 We posted a poster that the UUA Office of Youth & Young Adult Ministries created to help older adults talk to young adults at coffee hour. It was a sensation! As of this post 868 people have liked the picture. 1182 people have shared the picture. And 166 have commented on the picture. We’ve not seen anything like this in the land of Unitarian Universalism. It speaks to the thirst of all the ages to be authentically seen, heard, and enveloped in community. Director Carey McDonald wrote more about the graphic’s popularity on the Blue Boat blog. Here is your assignment: Before you sit down to your Thanksgiving table, please head over to the Growing Unitarian Universalism Facebook Page and read through the comments under the first posting of the graphic. The discussion is both fascinating and instructive. Read through the comments and consider how they might inform your Thanksgiving dinner table conversation. I believe the first Beyond in Congregations & Beyond are our familes. May you be surrounded by loved ones this Thanksgiving who help you practice being human. Happy Thanksgiving from the UUA Office of Growth Strategies. I really like the Coffee Hour Caution sign I sent it to the Sunday Hospitality Team at our church.